In over 20 years working as an editor and corporate writer, Ralph Johnstone has always had a secret hankering to write a children’s book. Now, with the help of Africa’s “most fun and fearless characters”, he has done just that! Ralph first encountered the Small Five while helping a Kenyan safari company develop activities for its children’s club – and fell in love with them on the spot. He says that visitors to Africa always thrill to see the fearsome lions and majestic elephants, but the little guys always get a raw deal. 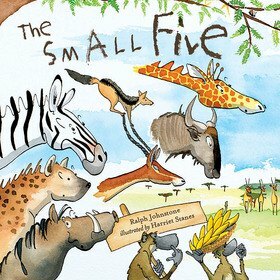 “After all, they’re just as robust and wily – in fact, some of them, like the leopard tortoise and rhinoceros beetle, are even tougher than the Big Five!” Ralph was inspired to share his fascination for these small creatures with children, and wrote The Small Five to bring them into the big picture. Ralph grew up on a traditional Malaysian fishing boat in Singapore and, after spending his younger years in Asia, moved to Africa in the early 1990s. Since 2008, he and his family have called Australia home.